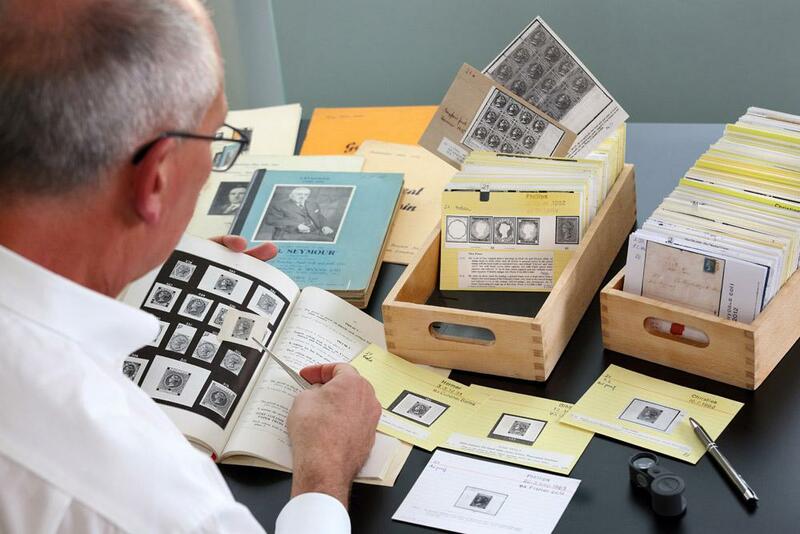 The Karl Louis "Card Index"
Describing Philatelic rarities calls for more than just quoting catalogue numbers and values. Provenance is a philatelic pedigree of former owners from the inception of philately until the present day. Those collections held in the highest esteem by their contemporaries and containing the great rarities, the modern day “Large Gold” exhibits, can be traced back to the collectors who once owned the particular rarity and the auctions where they were sold and changed hands. Frequently, the further back a philatelic pedigree goes, the more coveted the rarity becomes. Provenance is a quality seal. As in Art, Provenance is an indispensible attribute: in this case, of valuable Great Britain stamps and covers. Provenance is a quality seal. As in Art, Provenance is an indispensible attribute. The most comprehensive Provenance files of rare Great Britain has been meticulously maintained by Karl Louis AIEP, FRPSL., Corinphila’s Managing Director. 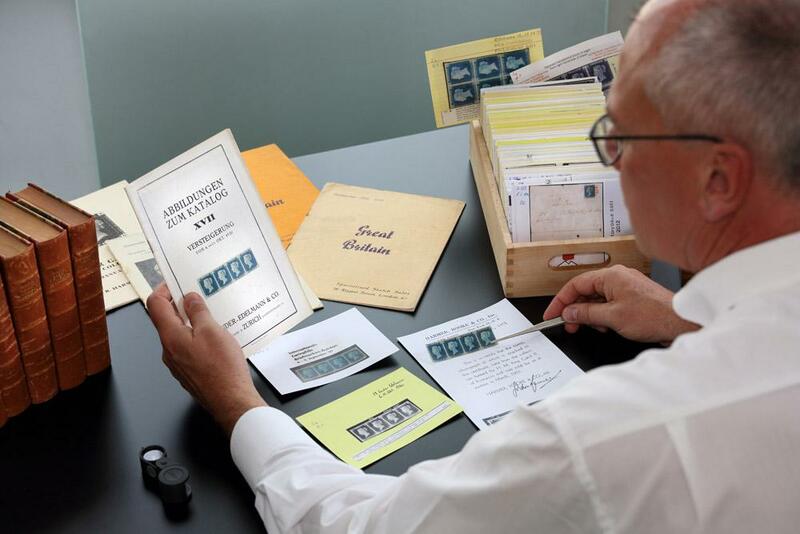 Karl started his Great Britain “Card Index” more than 35 years ago. Today it is – to the best of our knowledge – by far the most comprehensive and important census of British Stamps in the philatelic world. 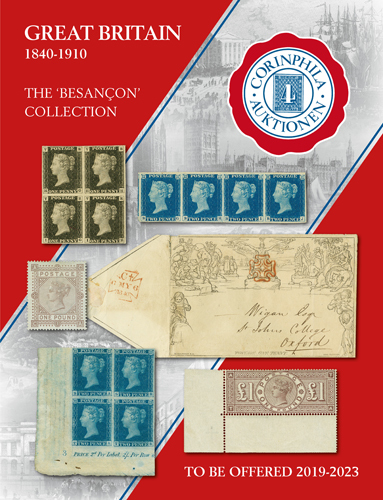 All Provenances given for items offered in the “BESANÇON” Great Britain 1840 – 1910 collection are based on information from the “Karl Louis Card Index” and we will provide as much information on previous owners and sales as possible. We believe that this will benefit both potential buyers and future collectors in the “BESANÇON” series of auctions to be held at Corinphila. Treasury competition essays, die proofs, Imprimaturs, Postal Notices, rainbow trial experiments, May-date-usages, inverted watermarks, Penny Black plate 11 in singles, pairs and covers, plate 5 „PB“ states and re-entries, mixed frankings, foreign destinations, Registered letters, 2d bisects. SPECIMEN overprints, Postal Notices, die proofs, Imprimaturs, plate 11 on Dickinson paper, 1d. plate 5 „PB“, plate 33 „PA“, plate 40 „KB“, plate 75 „LK“, plate 77 „BA“ (‚A‘-missing and corrected), 1d plates 175-177 from singles, 2d plate 4 states, 1d & 2d „lavender tinted paper“ and „violet-blue“, foreign destinations, Registered letters. SPECIMEN overprints, die proofs, plate proofs, Imprimaturs, reprints, 1d scarcer plates 53, 64, 65, 2d plate 4 states, perforation varieties. die proofs, plate proofs, Imprimaturs, SPECIMEN-overprints, reprints, Postal Notices, 1/2d. plate 9, 1d plates 77 and 225, 1 ½ d. unissued „rosy mauve“ and „OPPC“-error, perforation varieties. essays, proofs, Postal Notices, unusual destinations, printing varieties.